We've reviewed an OSO Mount before and we liked it a lot. Combining a clamp type mount with their unique soft suction base, the mounts can adhere to surfaces where others would fail. Now OSO have brought out a new design, the U GRIP, designed for the current crop of smartphones. The soft lined jaws are spring loaded and grip your phone securely and, with a maximum width of 5 inches, should be able to accommodate even then largest handsets, Galaxy S3 and HTC One X owners will rejoice. As with all OSO mounts, the U GRIP comes with the unique suction mount and an adhesive disk as well. They are available now for £24.99 from OSO's web site here. I bought an OSO Space Mount on the strength of your glowing review which easily opens sufficiently wide to hold my Samsung Galaxy SII smart phone. What's not so good is the wobbling. The whole mount arm is made of quite flimsy plastic, so there's no obvious way of steadying it. From the photo it looks as if the U Grip will suffer from the same problem. Odd. I have a Space Mount in the car, holding my SII as it happens, and I've not noticed that issue? Where is it wobbling, at the ball joint or in the plastic arm itself? I found that I could not tighten up the nut on the ball joint enough to avoid movement when holding a satnav. I have some of that non-slip matting that stops things slipping around on the dash. I put a small piece into the ball seating and that has more or less eliminated the movement, but there is still quite a bit of vibration. But satnavs are heavier than mobiles. Same problem here with the Space Mount. Fantastic grip but excessive wobbling when holding my Samsung S2 which can't be eliminated by tightening. Sent it back for a refund. 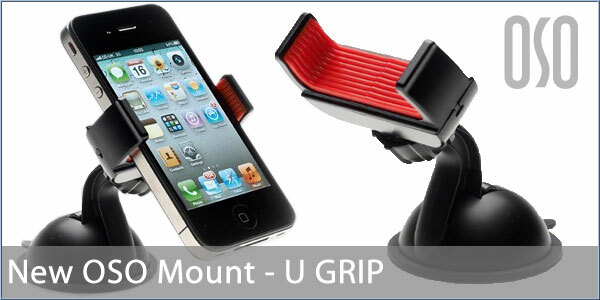 Would try a a U Grip Mount, but fear it may suffer from the same problem! I agree about the wobbling. I've got a TT XL Live which is a little weighty. The mount is attached to my dashboard as I wanted to bring the satnav closer to me as I have quite a sloping windscreen. The wobble isn't on the ball joint (although taht could be improved) but it seems to be on the actual arm which is plastic. The dashboard has a bit of give on it as it's teh soft plastic type but this accentuates it. I see OSO seem to have redesigned their mounts. They now have one aimed at Satnavs. It looks more substantial and probably more rigid. Anyone tried this newer version? Edited to show correctly formatted image link. The image on the OSO website definitely 'looks' more sturdy than the original[s] above. OSO Mount [not U-grip]: Took a punt on the new version. To me it seems considerably improved. The 'stem' is more rigid, and the lock nut is bigger and more grippy. The lock nut does not tighten up completely, there is sufficient play to adjust the viewing angle, but not so much that the device vibrates or moves the clamp. Not for devices deeper than 2.5cm. Edit [19/06/13]: Have used it for 5 weeks and am very happy with it.